Our good friend Laurent Arnese from Belgium has just completed his second, and most adventurous, Nepal trek with Langtang Ri Trekking & Expedition. In April 2015 he trekked the Annapurna Circuit and visited the wonderful hidden villages of Nar and Phu on a trail branch to the north of the normal circuit trail. Laurent enjoyed the trek so much he quickly planned another great adventure for later in 2015. This first Himalayan trekking experience just whetted Laurent’s appetite for more adventure. Living in Belgium meant Laurent has seen lots and lots of snow, cold winters and already many white Christmases. However, where Laurent lives the plains of Belgium can certainly look very pretty with a Christmas blanket of snow, but the local terrain lacks the grandeur residents of Nepal get to see every day in the Himalayan Mountains. And so Laurent spoke with Langtang Ri regarding organising a mid-winter trek to Mount Everest Base Camp to coincide with Christmas and New Year. This is actually a wonderful trek we can conducted for clients many times over many years. Our guides love this trek as it shows the beautiful snow-clad Himalaya Mountains at their best. The fewer numbers of trekkers at this time of year also allows the feeling of having the entire Himalayas and Mount Everest all to yourself. Laurent arrived in Kathmandu in mid-December and then flew to Lukla to start the trek to Mount Everest Base camp via the classic route of Namche Bazaar, Tengboche Monastery and the Khumbu Glacier trail. At this time of year the daily maximum temperature at Namche hovers around freezing and then dips to about -4 degrees centigrade overnight. 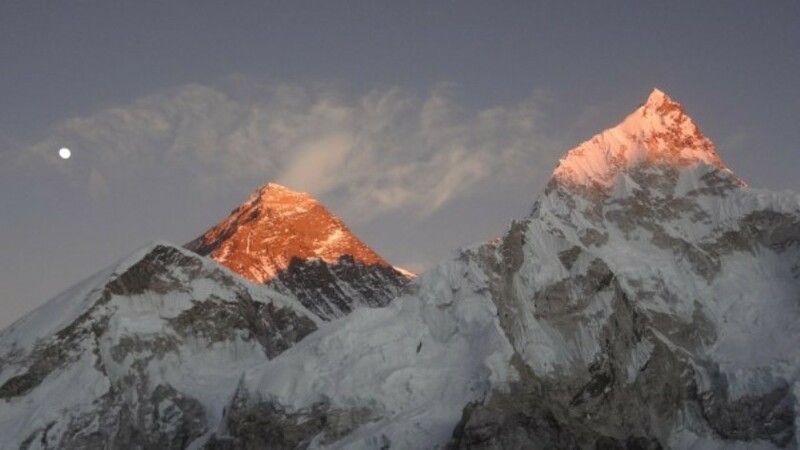 But up at the 5,000m altitude of Everest Base Camp temperatures sit below freezing all the time. But all you need for trekking at this time is some good down-stuffed clothing and a good guide that can ensure your safety and while on the trail. Even though the nights get very cold it is a great experience to sit around a warm wood stove in the tea house each evening and chat about the day’s walk and sights seen. Laurent reached Mount Everest Base Camp by Christmas-eve and then spent a wonderful Christmas day just to the south of Base Camp. The winter wonderland scene of towering mountains, creaking glacier and a dusting of pristine white snow delivered the perfect white-Christmas in sight of Mount Everest that Laurent was seeking. He told on his return to Kathmandu that was the perfect trekking experience and he is already looking forward to planning his next trek in the Himalayas of Nepal. So thank you Laurent for visiting Nepal at this time. Nepal is open and ready for all visitors. Langtang Ri Trekking & Expedition looks forward to showing Laurent another region of Nepal in 2016.